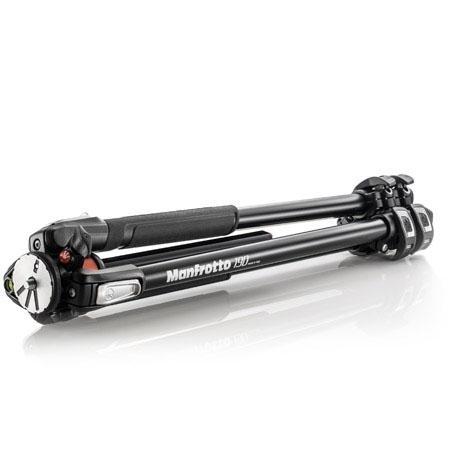 The Manfrotto 190XPRO3 is a compact 3-section aluminium tripod with advanced features and excellent build quality. Solid and fast to set up: The QUICK POWER LOCK (QPL) system is definitely one of the most eye-catching and unique features of the 190. It is a strong, ultra fast and ergonomic locking system that allows for complete extension of the legs with one hand opening. 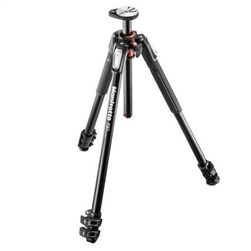 The black and silver color combination give the tripod a stylish look. Get ready to go everywhere: One of the most innovative aspects of the new 190 is its compactness, which allows for easier portability. The new patented 90° column is accessible when you need it to be, with a quick "one finger" operation. Easy integration with accessories: The 190 allows you to create a portable photographic studio, thanks to the new "Easy link" plug, which enables instant connection between tripod and accessories, such as LED lights for Macro Photography and VDSLR applications through arms and brackets. Rotating Leveling Bubble: The patented Rotating Leveling Bubble is quick to set up and allows you to position the tripod more precisely. It is easy to read, whatever the shape of the head or however the tripod is set up. Leg Angle Selectors: The new Leg Angle Selectors are also easy to set up, as they are made following the most innovative ergonomic standards and prevent fingers and nails being trapped in the upper casting.